No Matter the Color, All Our Paint is Green. WonderPaint™ is an eco-friendly, durable, water-soluble, UV-resistant exterior coating that does not crack, peel, fade, chip or chalk over time. Environmentally friendly, simple to apply and easy to clean up with ordinary soap and water, WonderPaint™ delivers a flexible, non-fading, breathable coating that resists stains, scuffs and scratches. WonderPaint™ pays for itself with a look that remains fresh for years and years. HOW IT WORKS The unique nano-technology of WonderPaint™ chemically bonds to the surface and provides superior UV protection. Its flexible, semi-permeable bond consistently outperforms other paints available today. When combined with WonderPrime™ using our procedures, WonderPaint™ won’t fade, crack, chip or chalk, outlasting other coatings in tests up to 15+ years. WonderPaint™…the Future is Here. Check the Product Sheet to see which products are required for proper application. We can color match any color! Please provide us with a color code from any major paint manufacturer or Pantone Matching system and we will mix and match your paint to spec. 25 YEAR LIMITED WARRANTY WonderPaint™ is guaranteed by its manufacturer, WonderPaint, Inc., to resist weathering for 25 years after application for film integrity and for 20 years after application for chalking. NANO-TECHNOLOGY The proprietary science, with 40+ years of development, combines acrylic and urethane molecules, producing high strength and optimum flexibility. So, they adhere better and last longer without cracking, peeling, fading, chipping, chalking or staining. ANTI-FUNGAL, ANTI-MICROBIAL WonderPaint™ contains ingredients that make it impossible for mold or mildew to form once the product has been applied and cured. This keeps mold and mildew from destroying the integrity and appearance of the surface. UV PROTECTION WonderPaint™ is the only liquid siding that has a UV package of both organic and inorganic UV protection which prevents yellowing, fading and changes to the coatings texture and appearance. 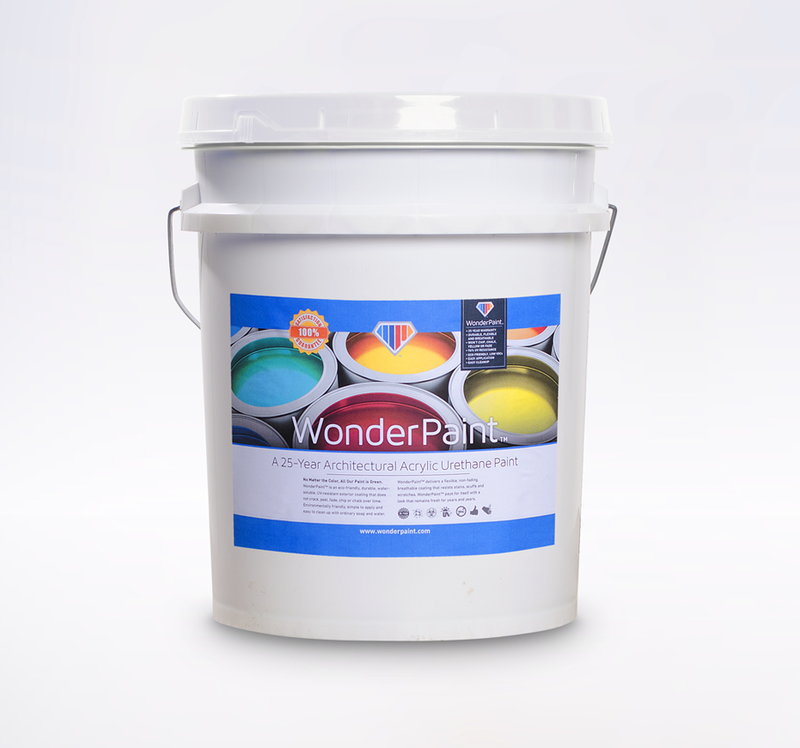 ENVIRONMENTALLY FRIENDLY WonderPaint is environmentally friendly, non-toxic, readily biodegradable, non-flammable, free of Volatile Organic Compounds (VOCs) and safe for the environment. LOW MAINTENANCE WonderPaint™ is extremely low-maintenance: just clean it with mild soap and water once a year. WATER-BASED/EASY APPLICATION AND CLEAN-UP WonderPaint is water-based and environmentally friendly, making it easy to apply and clean up using just mild soap and water.